A Biodesign Institute research team is working on applying the same principles used to remove contaminants from the environment, on the human body, in an effort to reverse the effects of aging. (PhysOrg.com) -- The same principles that a Biodesign Institute research team has successfully applied to remove harmful contaminants from the environment may one day allow people to clean up the gunk from their bodies—and reverse the effects of aging. The Biodesign Institute, along with partner, the Methuselah Foundation, is working to vanquish age-related disease by making old cells feel younger. Their collaboration addresses age-related problems, such as heart disease, macular degeneration, and Alzheimer’s disease, by understanding the root causes of disease. A number of diseases that appear with age are primarily caused by a lifetime of accumulated debris inside of cells. One theory of aging is that, as the molecular junk collects in our bodies through the years, it causes the onset of disease. For example, the buildup of a vitamin A byproduct is directly responsible for the leading cause of blindness in the elderly, macular degeneration, while the accumulation of sticky proteins in the brain has been linked to Alzheimer’s disease. Every day, millions of metabolic products whiz throughout our bodies to help nourish and sustain human health. Most of the time, those that aren’t used are filtered and passed out of the body, but over time some become resistant to degradation, piling up as junk in our cells. Our bodies are not naturally equipped to degrade these harmful substances; however, Schloendorn noticed that there is not an overabundance of these molecules in the environment. Therefore, there must be a source of natural enzymes that are capable of breaking down the cellular debris. In much the same way as the buildup of junk can put a stranglehold on the natural environment around it, the collection of these miscellaneous materials can place extreme stress on a cell. The enzymes capable of decomposing the junk are like implementing a recycling program in a landfill. They salvage the used materials and there is a possibility that the basic pieces can be reused elsewhere in the cell. “We are looking for these enzymes in all sorts of organisms. We have some that come from soil bacteria, we have one that comes from the crocus flower, another one that comes from mammals,” said Schloendorn. 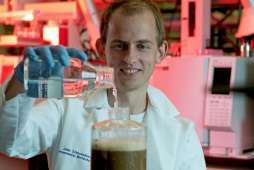 The idea of toxin degradation in the body dovetails with an environmental innovation by team leader Rittmann, who used microbes to break down toxins in polluted water. The microorganisms degrade petroleum hydrocarbons in contaminated water and leave clean water behind in a method called environmental bioremediation. The application of these principles to human health is called medical bioremediation. In the early stages of environmental bioremediation, the research team had to find microbes that contained enzymes capable of breaking down the pollutants found in the contaminated water. This is the same tactic being used to reverse the accumulation of the biomolecules in the body. Their bioremediation research began in 2005, when Schloendorn first learned about the Methuselah Foundation and its novel approach to solving age-related problems. Walking up to the cofounder, Dr. Aubrey de Grey, he volunteered to help achieve the ambitious goals the Foundation set forth. Dr. de Grey then approached Dr. Rittmann with the concept that the principles of environmental remediation could be applied to age-related diseases. Rittmann agreed that the concept has merit, and Schloendorn began work in Dr. Rittmann’s lab at Arizona State University’s Biodesign Institute soon after. The $300,000 partnership between the Biodesign Institute and the Methuselah Foundation has proven fruitful. For example, results published in the journal Biodegradation by Rittmann’s team announced the discovery of five microbes from soil and sludge samples capable of decomposing a molecule called 7-ketocholesterol. This cholesterol variant is widely accepted as a cellular toxin and thought to be a primary culprit in the development of atherosclerosis. The body does not routinely degrade it and its accumulation causes hardening of the arteries, which in turn leads to arterial blockages and heart attacks. The researchers are now exploring the use of microbial machinery to biodegrade 7-ketocholesterol to attempt to reverse the cause of arterial distress. The targeted decomposition of 7-ketocholesterol in humans may also open doors for the therapeutic treatment of other age-related disease. Reversal of the damage done to cells by destroying the harmful biomolecules will rejuvenate cells and make them physiologically younger. On a broad scale, this technique may eliminate death by ‘old age,’ allowing people to be younger at the cellular level, and extending not only human life, but also healthy human life.